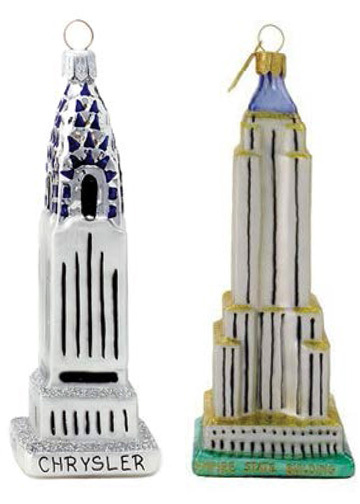 Our favorite New York City Art Deco icons have been interpreted as beautiful glass ornaments. Made the old-fashioned way - individually blown and hand painted- each ornament takes days to complete. We treasure the Chrysler and Empire State Buildings and you can too, by making them a part of your holiday celebration this year and for future generations. Each ornament is about 5” high and comes in a white box.